In the United States and much of the world, asbestos was used very heavily in most aspects of construction. It was also used in a wide variety of consumer, commercial and industrial products. The reason it was so prevalent was because it’s a cheap, naturally-occurring substance that has a remarkable ability to resist heat, fire, caustic chemicals and electricity. However, in addition to all of these helpful properties, it also causes cancer. These days, most people are aware that exposure to asbestos causes malignant mesothelioma, but this was a closely guarded secret for much of the last century. Those in asbestos industry were well aware of the dangers of asbestos, but since they also knew it would take between 20 and 50 years for people to get sick, they were willing to take that chance and pay later if necessary. When they eventually had to pay up, it caused a lot of companies to go bankrupt. However, not all of the damages were paid by the companies that produced asbestos. Many had what are now known as “historic policies.” According to a recent news article from the Financial Times, these claims are now costing the insurance industry $15 billion more than had initially been projected. The reason for this, as our Boston mesothelioma attorneys can explain, is because thousands of people are still getting diagnosed with mesothelioma each year, and many of those people are dying. While the insurance companies had hoped the partial ban on asbestos would result in a slowdown of the number of victims being diagnosed each year, that does not appear to be the case. Since insurance companies make money by selling policies and trying to pay out less in claims than they earn in revenue, it is not hard to imagine how they are tired of paying out claims when people develop malignant mesothelioma. According to one recent study, the insurance companies have already paid out nearly $65 billion, and that number is still rising to about $100 billion, which is the new estimate. One the reasons they were wrong on the estimates is because they were only making calculations based upon the number of workers they estimated were exposed to asbestos. What they failed to account for was children of those workers who were exposed through their parents and other relatives who came home from work each night still covered in the deadly asbestos fibers. 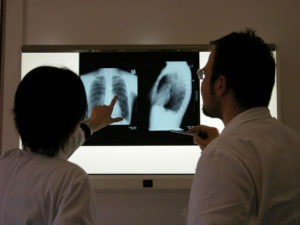 This type of exposure to asbestos is called “take home” exposure in mesothelioma lawsuits. In addition to this emerging class of mesothelioma claimants, there are also all of the people who are currently residing in structures that are filled with asbestos and are in a crumbling and dilapidated state. It is a sad reality that many of these people will one day develop the deadly form of cancer. For these reasons, it appears that it will be a very long time before we are no longer seeing victims of asbestos exposure.